AC Repairs You Can Count On! At the first sign your AC system is not working properly, seek an HVAC NATE-certified technician. The longer you wait to have that strange noise or smell checked out could lead to higher cost repair bills or AC system failure. Don’t wait until it is too late and you are without your heating or cooling equipment. Catching the problem early on could save you hundreds of dollars in repair bills. At the first signs of insufficient heating or cooling, irregular temperatures, strange noises from the equipment, odd smells or odors, deteriorating air quality or airflow, or just complete system failure you should seek professional assistance from a NATE certified HVAC technician. There are a number of claims in the HVAC industry that make HVAC technicians sound like they know what they are doing, but the North American Technician Excellence (NATE) certification program is the only closed book examination and certification program, administered by a third party, and tests real world working knowledge of HVAC systems. That’s why all of our service technicians are expected to complete and continue NATE certification and training throughout their career with SMO. 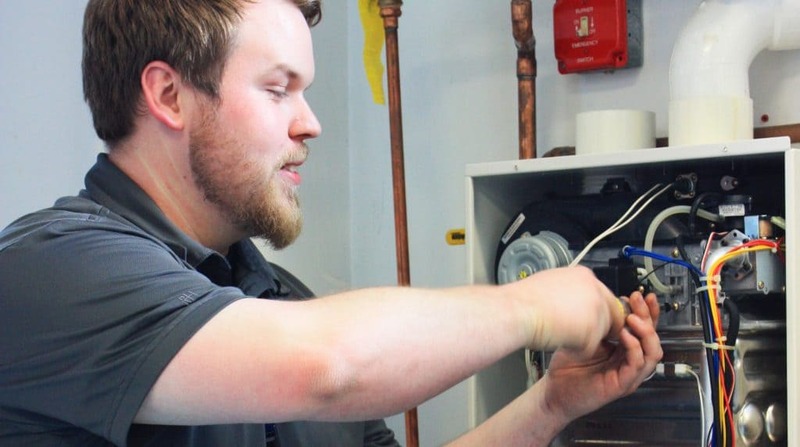 Beyond becoming NATE certified, our technicians complete over 2,700 hours of training every year to maintain and learn new working knowledge of heating oil, propane, air conditioners, boilers, furnaces, heat pumps, water heaters (tanked and tankless), fireplaces, generators, and more. Technicians continually strengthen their skills by attending regular classes at our state of the art training facility, the Shymansky Institute. The certifications and licenses that our technicians earn go beyond NATE certifications and include, the National Propane Gas Association’s (NPGA) Certified Employee Training Program (CETP), Journeyman’s License, Master’s License, Gasfitter’s License, and WSSC License in various programs offered. With such in-depth training from the Shymansky Institute behind them, you can be confident that our technicians will be able to fix any problem the first time and answer all of your questions about your heating and cooling systems. Not only will you experience the best technical support from SMO’s HVAC service technicians, you will receive the best client care! Our technicians care about you and take the time to go above and beyond repairing your HVAC equipment, by also addressing any concerns you may have with other HVAC equipment in your home, as well as make any recommendations for the future of your home comfort. Courteous, professional, clean and efficient service is what you can expect from SMO’s NATE certified technicians. We provide HVAC repair services for residents in Southern Maryland, including the Annapolis region, Arundel and Prince George’s Counties!